John McClane is a detective with the NYPD. He is not a spy and would look at you with a slightly wrinkled brow and an expression that doubted your humor or your sanity if you suggested it. In his mind he does not deal with spies in any way in his job. He is a cop first, middle, and last thing. He hunts down bad guys and brings them to justice, usually alive. It is what he is good at and the only thing he can imagine doing. To several different groups of terrorists, foreign and domestic, as well as a couple of would-be Russian dictators, McClane may not be a spy but he is decidedly a major pain on the rear who is either too stupid or too stubborn to stay out of their business. McClane would chuckle in his particular sardonic manner that he was both. McClane had been a cop in New York City for eleven years before the events at the Nakatomi Plaza in Los Angeles gave him his own brief moment of fame. The Big Apple was his home and the job was something he was good at. Perhaps it was the only thing he was good at, he would say, as his marriage to Holly had fallen apart and she had taken a good job in a career change on the other side of the continent. With her went their two young chilcren, Lucy and Jack. As the series progresses, the two try to reconcile but then eventually split for good. The children grow up detached from their father only to be forced together again and find out that he has tremendous love for them. He just has a hard time showing it. McClane also has a tough time following orders. He is considered a maverick or a rogue cop to many of his colleagues and to most of those who had the misfortune to be his boss, he is insubordinate and incorrigible. And this was before his marriage fell apart and he started drinking only to get to "two steps away from becoming a full blown alcoholic" (McClane counters it was just one step). McClane likes doing things his own way. Luckily for him, he has a habit of getting the job done so he has kept his badge despite the indigestion he has generated in upper management. The leader of the terrorist/gangster band that McClane combatted in the L.A. skyscraper once referred to McClane as a "cowboy", believing he was another John Wayne. McClane jokingly responded that he had always favored Roy Rogers. This led to an inpromptu comment later in the escapade, one that he had used a few times later when the action is about to get extremely rough, "Yippey-Ki-Yay, Motherfu...". It rather fits. In 1966, author Roderick Thorp created a gritty detective novel entitled The Detective. It dealt with a homicide detective for the NYPD who is in charge of the investigation into the murder of a gay man in what was clearly a hate crime. The novel delved deeply into the different feelings people had towards homosexuality and those that prey on the gays. Two years later a movie was released with the same name and starred Frank Sinatra as the detective, Joe Leland. Both the book and the movie enjoyed reasonable success. Thirteen years and several novels later, Thorp returned to the crime scene after a few books about widely different subjects. The story goes he had watched the movie The Towering Inferno and dreamt that night about a man being chased through a skyscraper. The idea stayed with him and in 1979 he revised his character Joe Leland. Instead of New York, though, he set the scene in L.A. where Leland was visiting his daughter. The culprits were terrorists led by a man named Gruber whom Leland had known briefly during WWII. The second book was called Nothing Lasts Forever. Some years after the book was released, its rights were purchased and a movie made of it. The character name was changed to John McClane and the person McClane was visiting went from a daughter, Stephanie Gennaro, using her mother's maiden name, to be Holly Gennaro McClane, estranged wife of the Leland/McClane. The director switched the lead bad guy from a terrorist to a master criminal masquerading as a terrorist and threw out the part about the two character having met before. Other than that, much of the book made it into the screenplay, superbly penned by Jeb Stuart and Steven E. de Souza. The movie did very well, producing very respectable profits for the studio and turning Bruce Willis, already a television star from Moonlighting into a major action hero. 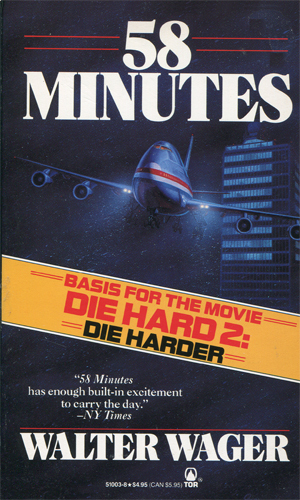 In 1987, highly skilled and terribly underappreciated author Walter Wager published a stand-alone action novel entitled 58 Minutes. Mr. Wager, no stranger to spy novels having penned several books in the I Spy and Mission: Impossible series under his penname of John Tiger, was also very adept in the action crime novels. In this book Frank Malone is a NYPD captain, divorced, who is at JFK to pick up his daughter coming in from California for Christmas. A man calling himself 'Number 1' takes control of the airport and those in the area and gives them just 58 minutes to meet his demands. The planes circling above are due to start crashing from lack of fueld and Malone knows he has to step in to catch the man behind it all. 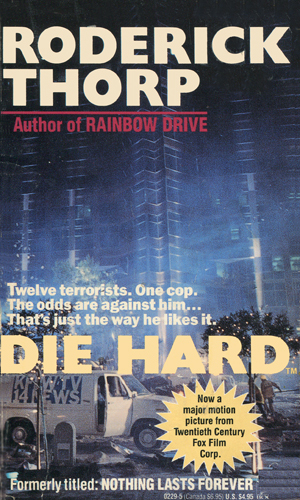 Looking around for another good book to use as a sequel to Die Hard, the studio bought the rights to the book and brought in one of the screenwriters from the first movie to adapt it. The reason for the airport seizing and the person behind it were changed but the basic concept remained and once again the NYPD detective John McClane was doing his thing. The third, and so far last, novel in the series was a novelization well crafted by Deborah Chiel based on an original screenplay by Jonathan Hensleigh. Hensleigh had originally created the story Simon Says but modified it to be a John McClane action piece. So far no books have been penned on the last two movies. 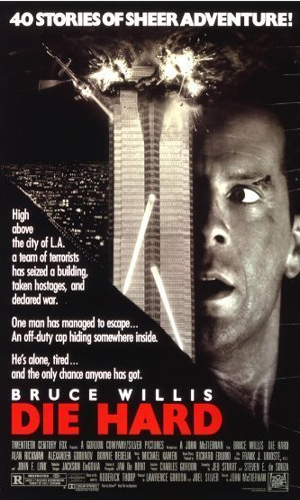 Visiting his daughter in L.A., NYPD detective Joe Leland (John McClane) is on hand when a team of terrorists seize a skyscraper to rob it. Frank Malone, a NYPD captain, is at JFK to pick up his daughter for Christmas when a man calling himself Number 1 takes control of the airport and surrounding fields, preventing planes from landing. A novelization of the movie - A terrorist organization sets off a bomb in Manhattan and tells the NYPD of a bigger one in a school somewhere. Unless John McClane and a 'good samaritan' solve a few crazy puzzles. An action movie done very well with characters you can like, bad guys you can hate, scenes you can believe and some you cannot but accept anyways, this is not something that happens that often - perhaps three or four times a year. 1988 was such a year when television star Bruce Willis, enjoying tremendous fandom for his role as David Addison opposite Cybill Shepherd's Maddie Hayes on Moonlighting, made great use of his off-time to make Die Hard. The movie was a fantastic success and launched his already skyrocketing career into orbit, a rotation he has kept going by not sticking with just one character but branching into many different types, albeit many of them "don't mess with me" types. But he was wise enough to know that Die Hard needed a sequel soon or people would quickly forget. 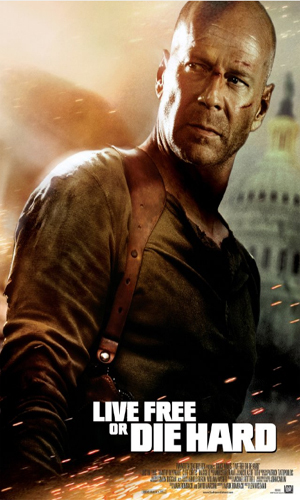 Two years later he came out with Die Hard 2, still great action and still a lot of fun. Then he put his John McClane torn t-shirt into a drawer (actually, from what I heard, he donated it) and went on to other things. Always leave the audience wanting more is a great performer's adage and he did. He would let five years go by before he brought the argumentative, uncontrollable NYPD detective back. This time he was not alone and that was genius (hats off to screenwriter Jonathan Hensleigh for having a great character like Zeus who could hold his own against McClane and to whoever came up with Samuel L. Jackson for the part). The two actors were incredible together and the movie was a ton of fun. So what does a great actor with a great character do next? Apparently it was to do lots and lots of other things until the bringing of McClane back again was newsworthy and enough for old fans to clap and new soon-to-be fans to flock to the theater. The character was quite a bit older, as was of course all of us, and a guy who still did not want to do what he had to do but he was "that guy" once more. The movie was awesome. 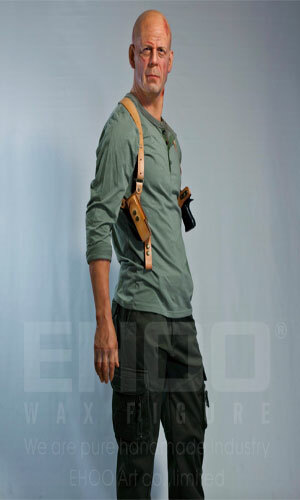 And then you had Timothy Olyphant and Maggie Q and no movie is bad with either of them, especially Ms. Q. 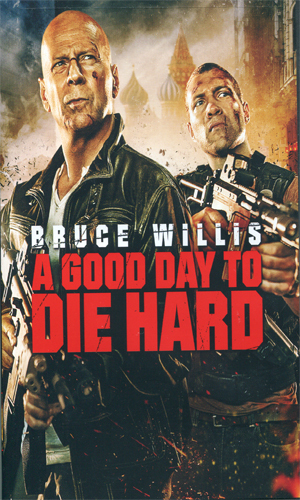 We did not have to wait over a decade for the next installment - just half a decade but the action was still great and having an even older McClane working with a very capable son who is rather surpirsed his old man could do some of the things he did was a delight to a lot of us old men who couldn't do them. Will there be a sixth movie? I would like one but if not, I got the DVD of five really great movies to watch more times than my wife can sit through. 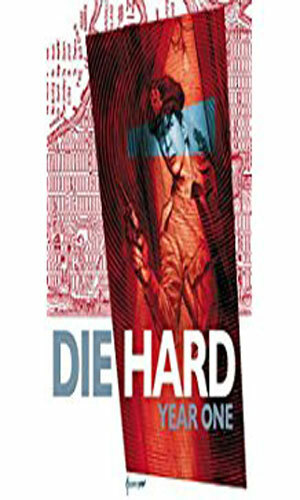 Visiting his wife in L.A. for Christmas, NYPD detective John McClane is on hand when a gang of thieves pretending to be terrorists take over a office skyscraper intent of stealing many millions in bearer bonds. 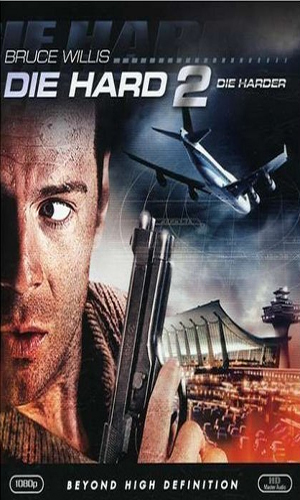 John McClane is again in the wrong place at the wrong time when he is at Dulles to pick up his wife flying in from L.A. That is when a rogue military group seize control of the airfield as they await the arrival of a dictator now in custody, planning to free him for money. Simon Gruber wants to rob the Federal Reserve building in New York but he needs to distract the NYPD so he uses a bomb scare in a public school. He also uses the opportunity to put John McClane through a lot of trouble to get even for his brother's death. A computer specialist, seeing how vulnerable to attack the American infrastructure was and angered that his warnings got him fired, put together a team to destroy much of the East Coast systems, and likely make a lot doing so. John McClane is there to save a geek and get involved. Thinking his son is involved with the Russian maffiya, John McClane heads to Russia to pull him out but instead gets involved in his CIA agent son's current operation. A graphic novel comprising the first 4 issues of an 8-issue mini-series. 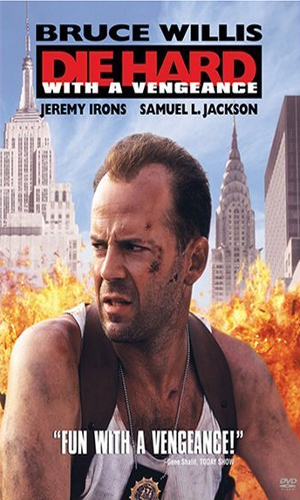 The collection tells the story of John McClane as a rookie cop in Manhattan during the 1976 Bicentennial. A bad guy named Alan Douglas has hijacked a yacht in the harbor and threatens to blow it up. A graphic novel comprising the last 4 issues of an 8-issue mini-series. The collection recounts how John McClane, now a detective, third grade, working with his partner, Olga, during the blackout in the summer of 1977. They must deal with a thief who has taken hostages in a massage parlor. 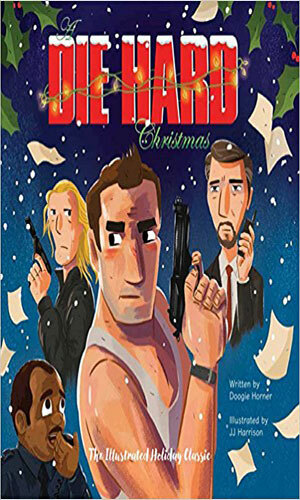 "The unconventional fan-favorite movie Die Hard is now an illustrated storybook—complete with machine guns, European terrorists, and a cop who’s forced to rely on all his cunning and skills (and the help of a fellow officer) to save the day. Based on the classic “Night Before Christmas” poem and filled with whimsical illustrations, this cleverly reimagined homage is destined to become a holiday classic." For NES, Commdore 64 and MS-DOS platforms. It was designed by Tony Van and is a side-scrolling single-player game. In the game John McClane (the player) rescues hostages and battles the terrorists at the Nakatomi Plaza from a top view perspective. The game is based on the 1st movie of the same name. For Commodore 64, PC, Atari St and Amiga platforms. This video game is based on the 2nd movie and was released 2 year later. 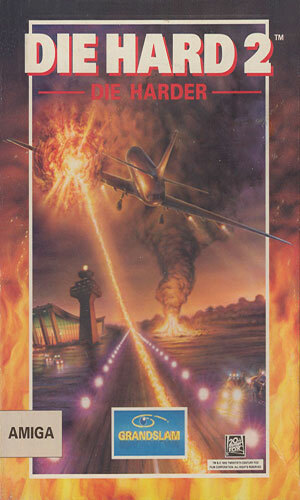 John McClane (the Player) fights against the terrorist army that are hold airplanes hostage in the air from the ground. For PlayStation, Microsoft Windows and Sega Saturn. 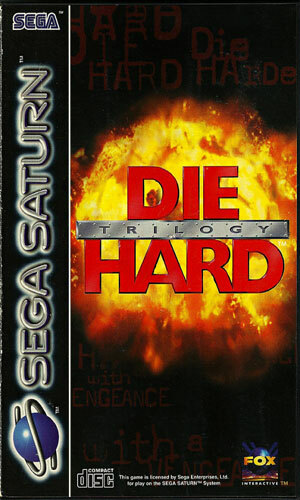 A game that is based on the first 3 Die Hard movies and is like having three games in one. 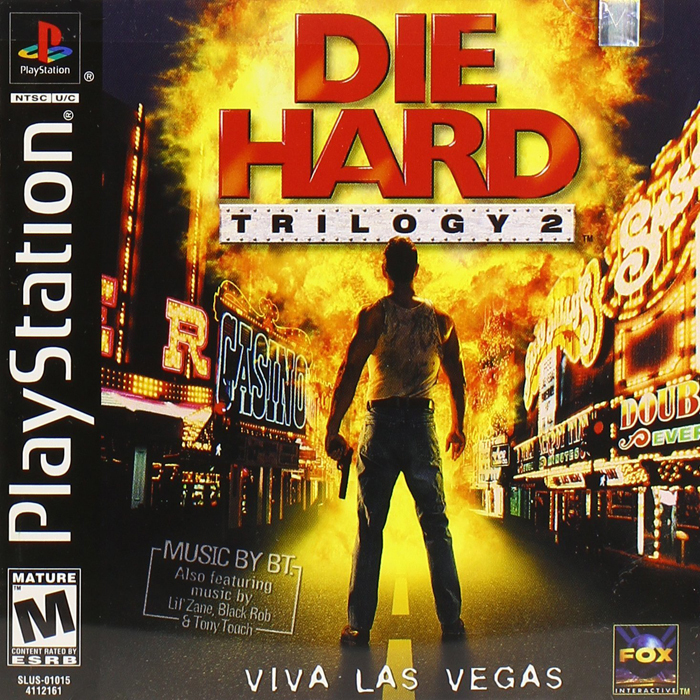 With three chapters as follows; Chapter 1 is a third-person shooter type games where the player is John McClane, Chapter 2 is a first-person shooter type game again where the player is John McClane, Chapter 3 is a driving-mode type game where the player can play as McClane or Zeus Carver and drive any vehicle that's come across through the streets of New York. A number of characters from the 3 movies appear in this game. For PlayStation and Microsoft Widows. 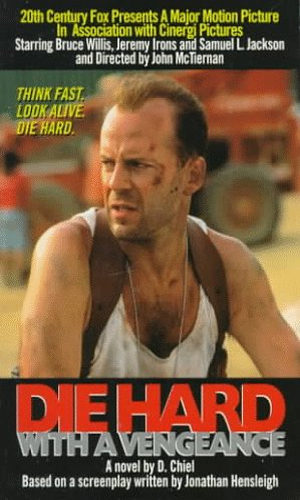 A sequel to the game Die Hard Trilogy and not based on any of the films. This game is divided into 3 part like the one before it. The 3 parts are a third-person shooter, a light gun and action driving. Each part is like a game unto itself, but the game as a whole just has a single original story. In the story John McClane goes to Las Vegas and in true Die Hard fashion fights terrorist bad guys. A 7 inch tall action figure of Bruce Willis as John McClane. 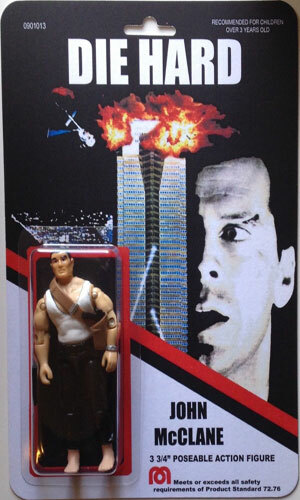 It is from the Cult Classics 3 Series and depicts him in the 1st Die Hard movie. The action figure comes with a plastic machine gun that has a rubber strap and a base that look like part of the roof of the Nakatomi Building. Yet it will not stand up without its base. Yippee-ki-yay it's a fair likeness. 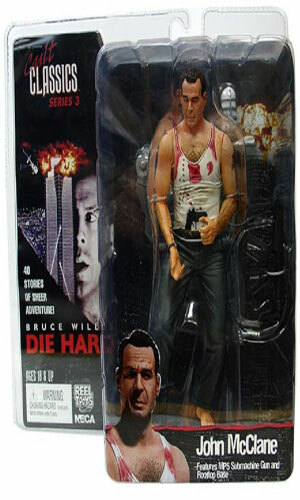 A 3 3/4 inch action figure of Bruce Willis as John McClane. Recommended for ages of 3 years old and it can be posed different ways. It was based on the 1st movie. There were to be other action figures that are part of this set as shown on the back of the package. An article by John Carlin that was first printed in Wired Magazine on May 1st, 1997. It is about warfare in the digital age and was reprinted again in Wired Magazine in 2007 This article was used as the basis for the 4th Die Hard movie called Live Free or Die Hard. Yet 20th Century Fox first used it as the basis of a screenplay that was named WW3.COM, but never made. A life-size wax type statue made with silicone and resin of Bruce Willis as John McClane. Created in China and realistic from all angles with real looking human like skin. 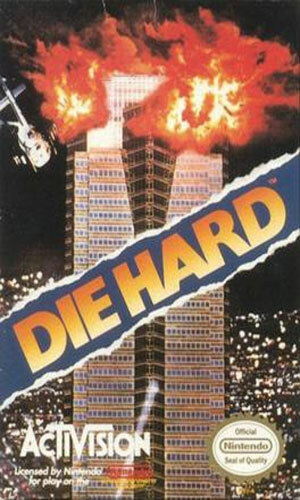 It was released to promote the 4th Die Hard movie. Would you like one in your Man Cave? "Yippee-ki-yay it will cost you $12,900!" Bruce Willis as John McClane was immortalized in an edible life-size chocolate statue to promote the release of the 5th Die Hard movie in Japan on February 14, 2013. 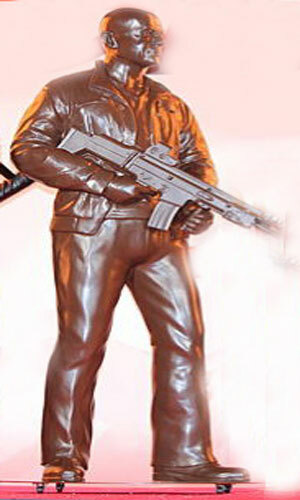 The statue was even holding a machine gun. Does it really look like him? Yippee-ki-yay look and judge for yourself. But, don't try to eat it. 20th Century Fox/Harper Design Intl. 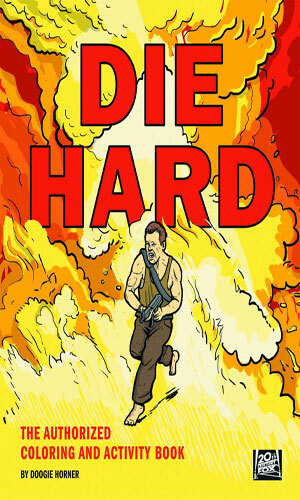 Experience Die Hard in a creative and fresh new way with this Coloring and Activity Book that is an authorized retelling of the now classic movie. Relive your favorite scenes and quotes that made the movie a Box Office Hit. Die Hard diehards can savor this black-and-white line drawing recreation. With a number of classic scene to color and entertaining activities all fans of the movie will be shouting "Yippee-ki-yay!" It was when I was in a store buying the fifth DVD in the series that I stared at it and I realized something. Here is a character to fights terrorists (well, a gang that pretends it is a terrorist group), actual domestic terrorists and rogue soldiers, another terrorist gang some of which are also criminals in disguise, cyber-terrorists, and then would-be dictators. Why was he not in my list? Now he is. 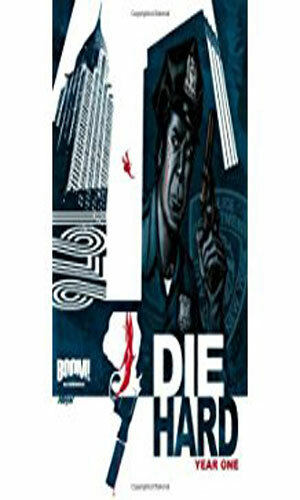 The genesis of the character is an interesting one for the author had created a cop story with an intersting detective. Many years later he brings the character back but puts him in a totally different environment facing completing foreign, to him, adversaries. Then a Hollywood producer takes the character, has him remodeled somewhat and renamed for a movie. Should the very first book about the original character be considered part of the series? Ahh, too complicated. I loved the heck of the first movie and enjoyed very much the second. The third had a totally different feel to it but was so good that I bought the DVD and then went back and bought the first two. I went opening weekend to the fourth and again to the fifth. And the week each went on sale, I bought the DVD. I really like Bruce Willis movies and I love John McClane movies. I was planning a John McClane marathon weekend but my wife thinks I'm crazy enough after two separate "24" marathons a few years ago. To the few critic detractors who have written that McClane has gotten too old for this stuff, I would counter that one of the great things about the McClane character is that he would totally, whole-heartedly, agree with that observation. He would then proceed to kick some bad-guy behind. I, like McClane, am too old for such activity but I do not have to do it. I can watch Bruce Willis do it. Thank you, Mr. Willis.